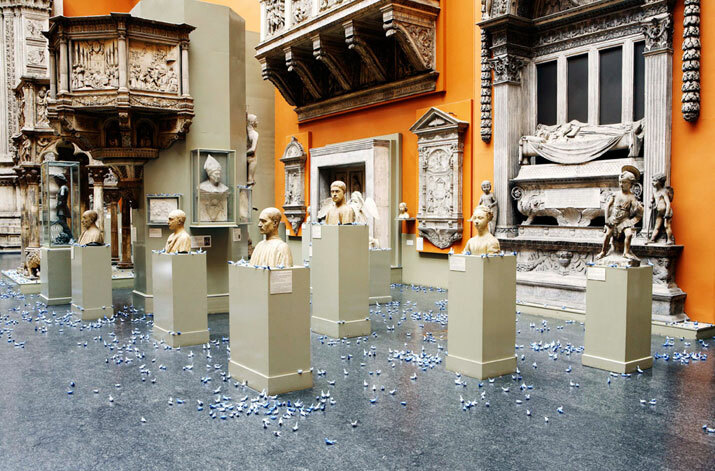 Trophy was a new work commissioned by the V&A Museum that played with notions of value, permanence and the culture of collecting. 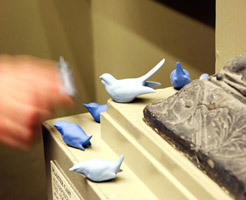 The artist worked in collaboration with Wedgwood to produce 4000 small birds made from Jasper Blue –an historical material created by Wedgwood in the 1800s– that were then displayed throughout the Cast Courts; the concept was to create a unique object for the museum’s collections that would be both beautiful and desirable. 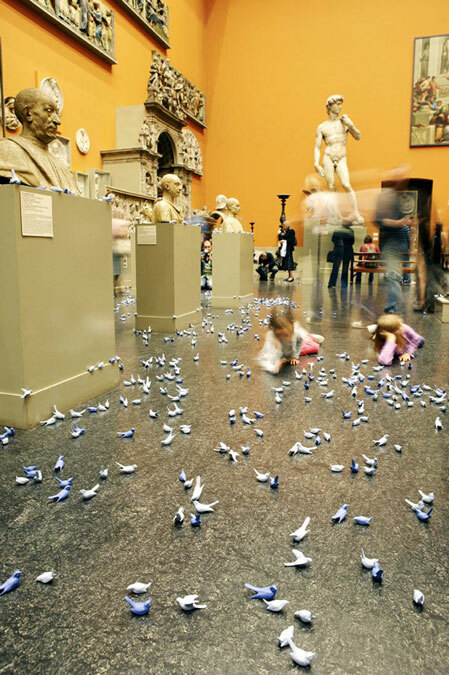 Within five hours of opening, the public had taken each one of the 4000 birds that made up the collection; although they were not formally invited to take the birds home, many followed the behaviour of others in the space. 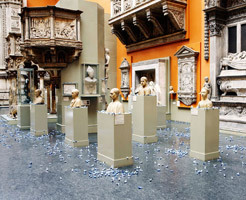 Trophy was a temporary installation created in the Cast Courts of the V&A Museum; the museum wished to engage with ceramics in a unique way and to encourage interest in non-traditional approaches to material specialist interests. 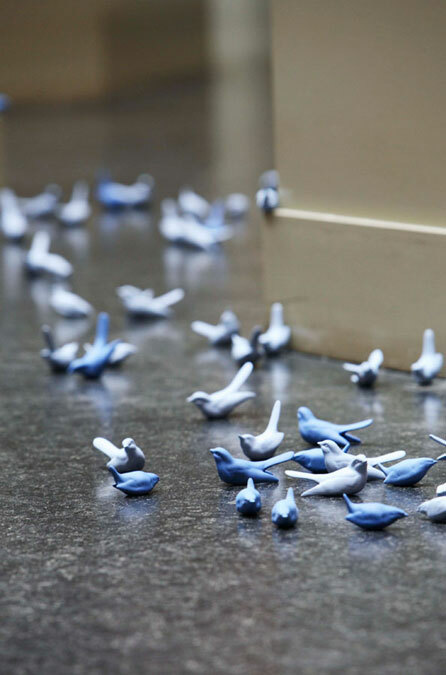 Clare Twomey’s installation comprised 4000 birds made from Wedgwood Jasper blue clay displayed throughout the Cast Courts; the work considered the nature of the building and its historic role, to permanently hold a valuable collection for public view. 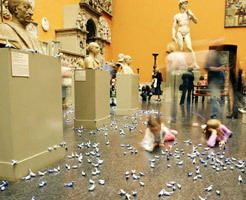 The birds could be taken away, creating a unique activity in the context of the museum: visitors were able to effectively take an object from the V&A’s collections. 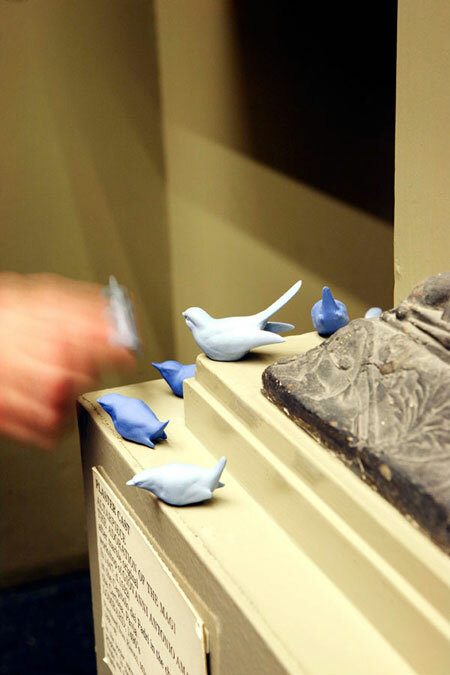 By collaborating with Wedgwood in their production, Twomey attributed a sense of history and worth to each individual bird; the audience perceived them as precious and desirable. 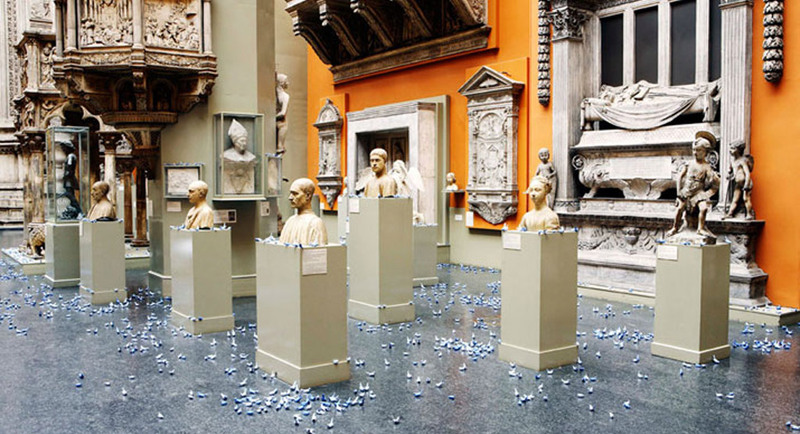 Twomey’s work encouraged the audience to consider the role of the museum and how objects arrive at, and become part of, the museum’s collections; ‘Trophy’ raised awareness of the breadth and diversity of ceramic practice. 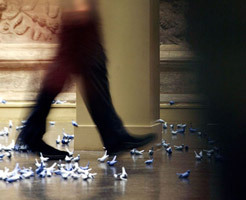 As part of the installation, Twomey invited visitors to send through images and excerpts of what had happened to the birds: she received hundreds of emails and pictures that clearly communicated the thought given to this work at the V&A. I chose this particular bird because I liked the cobalt colour – which reminds me of the decoration on the traditional Japanese ceramics I collect – the jaunty angle of the tail, and its particularly sharp beak. He’s now living on my bookshelf with other miscellaneous objects, including Japanese and Indian gods, a Statue of Liberty cow and pink Eiffel tower. I took the bird cause I really like the pointed beak and the tail. This breed of bird looked like it was a more proud bird, defending its patch. So it will continue to do that in my bedroom! Its new home for a while will be in Willesden! The desire to democratise the world and to locate one’s place in it can be marked out metaphorically in space. 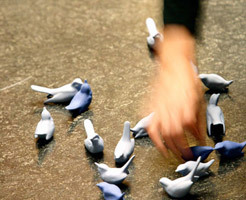 Ceramic artist Clare Twomey creates a territory in which people can engage in thoughts about our responses to nature and the environment, to history and the cultural landscape, to possession and loss. 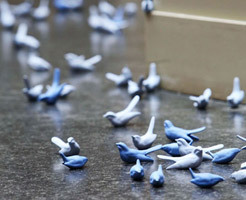 Her recent one-day installation at the Victoria and Albert Museum in London consisted of thousands of tiny unglazed ceramic birds made at the Wedgwood factory in its trademark shades of blue ‘perched’ all over the ground and over the museum’s collection of dozens of life-size castings of famous historic sculptures. Entitled Trophy, the visitor had the chance to select and take home a bird, thereby freely ‘collecting’ a rare object from the museum. But over the course of a few hours, the continuous removal of birds created evident ‘deterioration’ in the work as a whole, a collective loss experienced by the visitor in the face of personal gain, the trophies of the title. 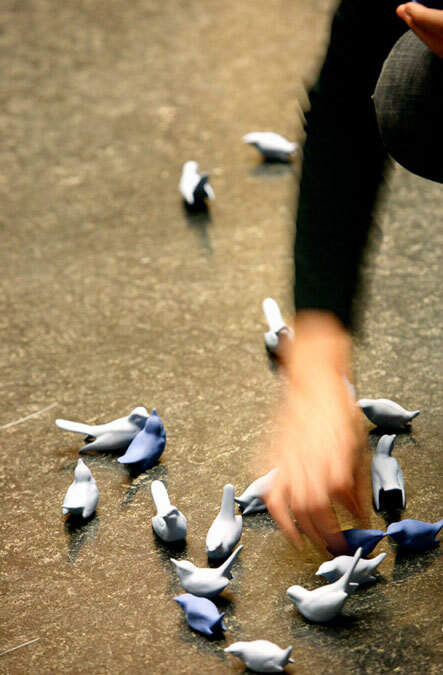 Handfuls of birds were stranded in high places; the rest had poetically taken flight. 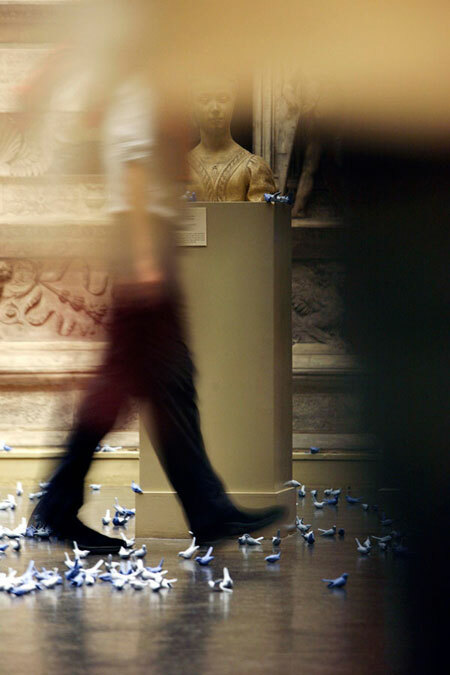 ‘The visitor wanted to have a precious thing to take home: a choice that is made by the public, the guest’. 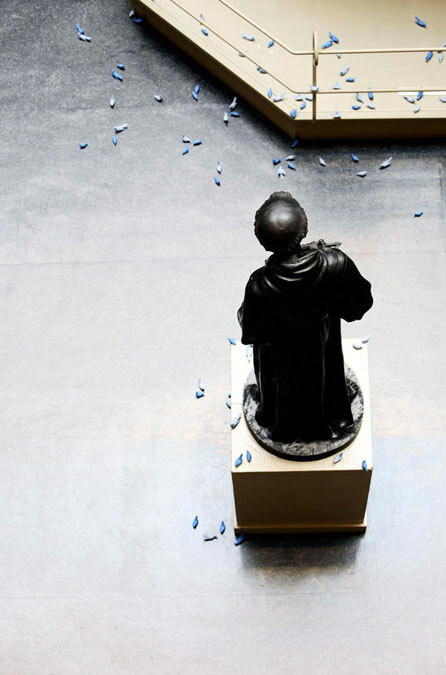 In the permanent, controlled space of a museum Trophy offered an eloquent comment on democracy interaction and change. Ownership and authorship are both atomised by such works. The single link between maker and owner is replaced on both sides by a shared, interactive experience, an important procedure in contemporary craft practice. The aura conferred by the status of uniqueness is dispersed amongst the many involved. 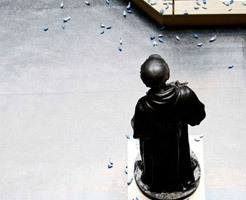 New thinking about craft can occur with installations such as Twomey’s: ‘The revelation of new knowledge…exists in the fluctuating interface between the materials of art – the fashioned artwork – and the sensibility of the onlooker,’ an extension of Roland Barthes’ view that the authorial voice belongs to both writer and reader’. Each bird in Trophy can be seen as a commodified souvenir, a symbol perhaps of our ambiguous relationship with living nature. This relationship is as contested as our relationship to tradition and the past.